For the Modern Groom, there is an understanding that their wedding presents the ideal opportunity to look their very best, in a suit that reflects their personality and works with the style and theme of the day. It is no longer the only option to hire a suit for your own wedding. This could be the moment to consider a custom-made suit, one which will be developed from scratch according to personal measurements, this will create a block that is unique. The fabric that is selected will be cut and the suit will fit perfectly, regardless of body shape. One of the joys in ordering a tailored wedding suit is the opportunity to select all of the details. From the fabric, buttons and the colour of thread through to the shape of the lapels, custom made suits can be literally customised to create a totally individual look that is very personal to the groom. We offer the opportunity for the Bride and Groom to come for a consultation where we can discuss their plans, from the style and format of the day to the theme and colours that will be used in the bridal party, decorations, flowers and entertainment. During the Groom session; measurements will be taken to ensure a perfect fit. A try on the garment may be used to pin areas such as shoulders and waist to work with body shape. Advise will be given on the most suitable fabric for the suit. This may be influenced by the destination of the wedding, if located in a hot climate, lightweight cloths may be suggested to keep a cool groom on the day. Colours will also be discussed, not only in reference to personal skin tone and hair colour but also keeping in mind the possible repurposing of the suit after the day. Design inspiration will be discussed in terms of styling- Jacket lapels, waistcoat shapes and trouser details. Styling details including lining colour or print, (this is often a useful way to tie in the colour scheme); button choice and personalisation (Monograms can be placed on collar and lining of suits), will also be explained. Style advise will be offered for the complete look, including shirts, ties, pocket squares and shoes. We can host a party of groomsmen to include the best man, ushers and other key guests, such as the father of the bride. 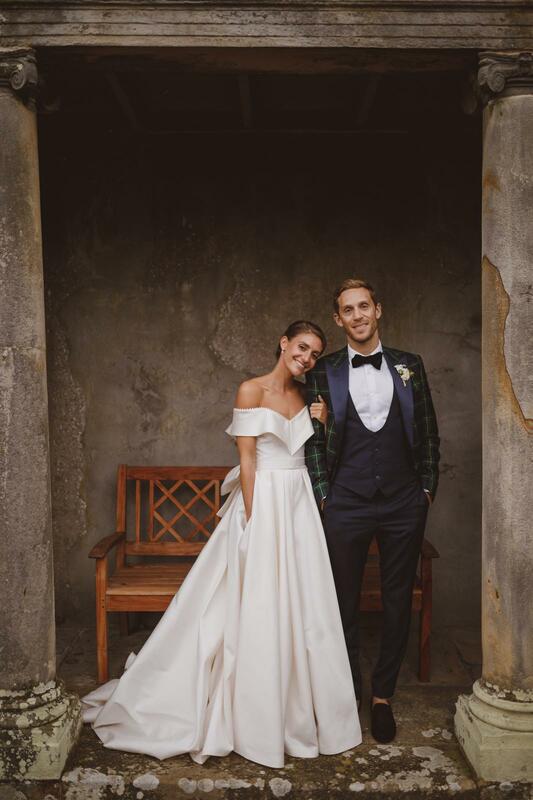 Should you require it, our tailors can also visit on the day of the wedding, to ensure all suits are perfect and all styling details are looking their best. • When is the ideal time to arrange an appointment with you to start the process of picking out his wedding suit? We would recommend allowing 3 months before the wedding. • How many appointments do you suggest in the process for everything to be perfect? 1. Consultation – Discussion about the Wedding, Date, Theme, Colours, Groomsmen and all requirements. • When is the ideal time to go for their final suit fitting? We would suggest the Final Fitting takes place 2 weeks before the wedding. • Are there certain types of suits, materials or textures that work better in summer versus winter months? We would advise on fabrics and styles suitable for the occasion and season at the measure and design stage, having discussed the wedding plans at the Initial Consultation. • Who do you suggest attends the first meeting with the Groom? It is completely up to the Groom, who attends the Initial Consultation. Often, he will bring his bride-to-be so they can discuss any themes or colours for the wedding. Some couples like to keep their wedding day outfits as a surprise. • Do you ever recommend which accessories to match the colour of the bridesmaid’s dresses for the groomsmen? We will give styling advise based on the final suit. Some grooms choose the colour of the lining of the suit to work with elements of the wedding, such as bridesmaid dresses or flowers. • Do you have any tips or advice to help the Groom chose their shade of suit? We will advise on colours that work with the Groom’s hair and skin tone. • What is a fun way to be individual? Choosing unusual details – ie fancy linings give an individual look; we can also personalise the suit on collar, cuffs and inside with initials, a nickname or even the date of the wedding. • If someone is deciding between a morning suit, regular suit or black tie what would you suggest for them? We would discuss the wedding style, time of day, formality and theme in the initial consultation and advise on what suit would be the most appropriate. Currently, we are seeing many grooms who want a suit that they look and feel fantastic in but can be re-purposed and worn after the wedding. • What is something the Groom can do to stand out from his Groomsmen? It is a good idea for the groom to wear something that makes them stand out from the rest of the party. Sometimes this can be the addition of a waistcoat, or the groom’s suit is in a contrasting fabric – a check rather than plain. • What is your opinion for guys deciding whether to rent or buy?